That's what I am talking about. 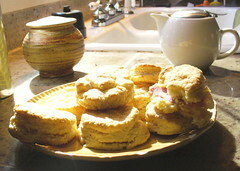 Biscuits and country ham. Wish you were here. Anton Zuiker has conveyed an invitation to a Triangle blogger happy hour next Wednesday. Lord knows, a drink would make this blogger happy. For an hour or so, anyway.